The sternoclavicular joint is the joint between the clavicle (collarbone) and sternum (breast bone). It is an uncommon injury when you consider all shoulder injuries. It typically occurs in contact and collision sports, such as football and rugby. It is a very painful, and potentially dangerous, injury, and a sports medicine physician should see athletes who are suspected of having this injury immediately. Typically the athlete is injured with a direct blow, either to the chest or shoulder. Depending on the direction of the force, a blow to the shoulder can cause an anterior or posterior sternoclavicular dislocation. An anterior dislocation of this joint means that the collarbone has popped out in front of the sternum. A posterior dislocation means that the collarbone has gone behind the sternum. 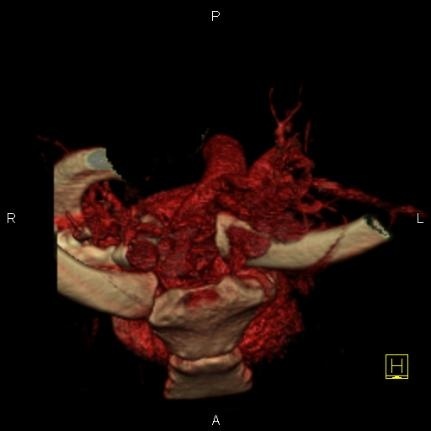 While both types of dislocations are very serious, a posterior dislocation can be a surgical emergency, as the end of the collarbone becomes extremely close to the airway and large blood vessels of the heart and chest. Should I be worried about my collarbone popping in and out? The athlete will complain of pain in the shoulder and/or chest immediately. He likely will have difficulty moving the arm due to the pain. Posterior dislocations can often cause the athlete to have difficulty breathing, and the physician may notice that he is short of breath or wheezing. 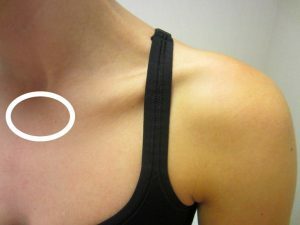 The sternoclavicular joint is the joint between the end of the clavicle and the sternum (white circle). Physical examination usually shows that the end of the collarbone is very prominent on the injured side if it is an anterior dislocation, and the athlete will be very tender at that location. Evaluation with x-rays, and a CT scan if needed, is critical, so I send players with suspected sternoclavicular dislocations to the emergency room right away. Treatment of these injuries depends on the direction of the dislocation. Anterior dislocations can be put back in place with gentle pressure on the clavicle, pushing it back in line with the sternum. Sometimes it’s difficult to reduce into the proper position, or it pops back out of place, but fortunately an anterior dislocation leaves only a cosmetic deformity. Usually little long-term functional deficit exists after the athlete has recovered. A posterior dislocation, on the other hand, needs urgent reduction. Whether this reduction is done in the emergency room or the operating room is controversial. The clavicle needs to be reduced back into place with the sternum to prevent the clavicle from causing injury to the blood vessels and airway nearby. Occasionally surgery to open the joint and manually put the clavicle back into place is needed. Note the left clavicle (right side of image) dislocated behind the sternum on this CT scan. The end of the bone lies very close to the large blood vessels off the heart. Should I be worried about my collarbone popping out?